Establish an Ocean and Great Lakes Conservation Trust Fund and authorize up to $250 million in FY2010 for state funding, research and education. Given that the Boxer bill appears even stronger that HR21 in several aspects (pulling NOAA out of the industry-fawning Department of Commerce for example) it’s bound to face stiff opposition from salt-water special interests. They’ve already signaled their intentions to fight for business as usual in several letters of opposition to HR21 from, among other predictable sources: the American Petroleum Institute, Oil & Gas Association, National Association of Homebuilders, The Fertilizer Institute, some fishing industry groups and veterans of the anti-environmental Wise Use Movement of the 1990s including the Cattlemen’s Association, Public Lands Council and National Mining Association. They claim HR21 would “alter significantly the nation’s regulatory landscape” and “elevate national ocean policy above many, if not all, other considerations.” At the same time they claim that it’s “vague” and “controversial” (they particularly don’t like the idea that this will introduce the “precautionary principle — first, do no harm,”) and they say they’re worried the ocean bill will effect implementation of the National Environmental Policy Act, Clean Water Act, Clean Air Act, Endangered Species Act,” and other laws they historically have opposed. It’s also clear that if they can’t eviscerate a potential House/Senate Ocean Act these oilmen, barrier-island developers and their allies are prepared to initiate a disinformation campaign designed to portray protection of our public seas as a threat to, “a growing economy and the nation’s defense,” as they’ve already claimed. They should try selling that to Admiral Jim Watkins (Ret.) the former U.S. Chief of Naval Operations and Secretary of Energy under George Bush Sr. and Chair of the U.S. Commission on Ocean Policy whose recommendations are reflected in both Ocean bills. One useful way to support the Ocean Act is to be part of the Blue Vision Summit next March 7-10 in Washington DC that will show the new Congress and Administration there is a large and active constituency ready to work for the protection and restoration of our coasts and ocean. Summit participants will have a chance to meet with their elected representatives on Capitol Hill and make the case for the strongest possible protection for our public seas and the coastal communities that depend on them. 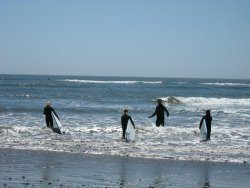 On July 29 the Governors of Washington, Oregon and California, following through on a 2006 commitment (see Blue Notes # 29) launched their own “West Coast Governors Ocean Action Plan,” aimed at ensuring clean coastal waters and beaches, protection and restoration of marine and coastal habitat and promotion of effective ecosystem-based management of ocean resources among other actions. It doesn’t sound like more sound in the sea either. Within two years the Governors are to report what measurable progress has been made in 26 action areas including reducing polluted runoff and marine debris (banning plastic bags and packaging is among the ideas being promoted), preventing the introduction of invasive species, exploring the feasibility of non-carbon based offshore energy projects and advocating for stricter ocean going vessel emission standards. 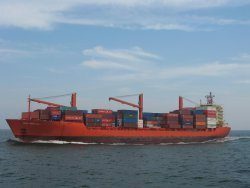 In July the California Air Resources Board approved the toughest restriction on ship emissions in the world. It would require the 2,000 ships that visit State ports every year to replace sooty asthma and cancer-causing emissions from bunker fuel (the kind that spilled in the Cosco Busan accident (See Blue Notes #40) with lower-sulfur fuel within 28 miles of the coast. Support for these new shipping rules comes from the kind of broad blue coalition we’ll need to pass the Ocean Act, including environmentalists, public health advocates and maritime labor. The shippers’ are challenging the state’s authority to make rules extending beyond its 3-mile state waters. They say they’re not against clean air they’d just prefer a voluntary approach. I know I’d certainly prefer a voluntary approach to California’s highway speed limits. So it looks like the left coast is finally getting serious about our blue frontier. Any word from our friends in New England? How about Florida where the “Ocean-Friendly” Republican Governor Charlie Crist has now come out in favor of off-shore oil drilling? 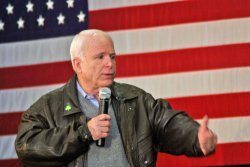 The John McCain Campaign recently hit a gusher according to an analysis in the Washington Post. Of the more than $1 million dollars Oil & Gas industry folks donated to the Republican Presidential Candidate in June more than three-quarters of the money was given after his June 16 speech calling for new offshore oil drilling in protected waters. 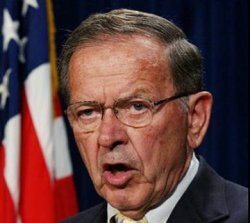 OK they’ll probably still call it the Magnussen — Stevens Act even though 84-year-old Senator Ted Stevens has been indicted on 7 felony charges. It wasn’t fish that brought him down but oil, specifically some quarter million dollars in home-improvements on the Senator’s house that were paid for by oil pipeline company founder Bill Allen but not reported by Stevens. Earlier Allen pled guilty to giving $243,000 in illegal payments to a lawmaker subsequently identified as Ben Stevens, Ted’s son. Both father and son have helped Allen’s company in various ways. Still, given the Senator and his family’s involvement in past dealings around the American Fisheries Act and Crab allocations he just as easily could have been brought low by an Opilio crab as an oil pipeline. “I’m a mean, miserable SOB,” Stevens has bragged and both fishermen and environmentalists tend to agree, even those who’ve worked in alliance with him. In 1998 Stevens sponsored the American Fisheries Act. Its original aim was to eliminate the giant Seattle-based factory trawlers competing with Alaskans for Bering Sea Pollack. One of the biggest trawler operators hired Steven’s son-in-law as their attorney. By the time the bill had gone through a series of closed-door meetings it emerged as a buy-back subsidy for the trawler fleet and Steven’s staffer who’d overseen the deal went on to become executive director of the at sea trawlers’ association. 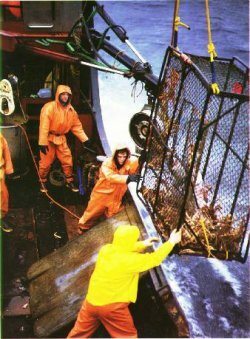 Later when Alaska crabbers won a quota, or guaranteed share of the catch, Stevens successfully pushed to give the land-based Seattle owned crab processors a 90 percent share of everything that came ashore despite a warning from the Justice Department this would violate antitrust laws. Steven’s son Ben was lobbying for the Crab processors association at the time. What we in the lower 48 call corruption and nepotism Alaska politicians like Stevens prefer to think of as friendliness and family values. 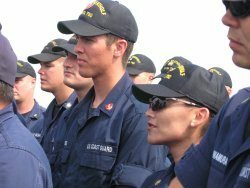 I’ve finally finished my book on the U.S. Coast Guard that took me to more than a dozen states including Alaska and Hawaii, also Washington DC, Bahrain and the North Arabian Gulf where, over the course of two years, I interviewed hundreds of Coasties who let me ride with them on their boats, planes, cutters and helicopters. I also talked to fishermen, mariners, boaters, politicians, enviros, storm survivors and others who’ve interacted with the Coasties from 9/11 through Hurricane Katrina and beyond. The publishing industry unfortunately works at a glacial pace, except given the rapid melting linked to fossil fuel fired climate change, that’s probably unfair to glaciers. 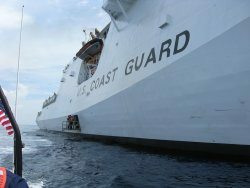 So expect, “Rescue Warriors — Riding with the U.S. Coast Guard, America’s Forgotten Armed Service,” to be out with St. Martin’s Press in May or June 2009. 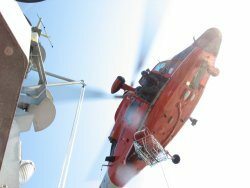 Anyone who cares about our coasts and oceans should want to know more about the Coast Guard and its commitment to the, “Safety, Security and Stewardship,” of our blue frontier. Also if you want to know what to do if a fishing companion gets a halibut hook stuck in his eye, this is the book.